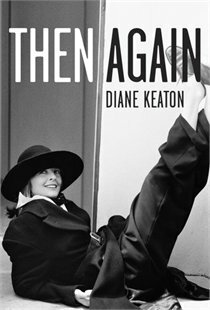 It’s interesting to read Diane Keaton’s memoir after Julian Barnes’ The Sense of an Ending. In contrast to Tony’s hazy past in Barnes’s novel, here we have memories strung together with clarity and adequate documentation. Take a look at these insert photos. I admit, they were the very reasons the second I opened the library copy that I decided I must get my own to keep. 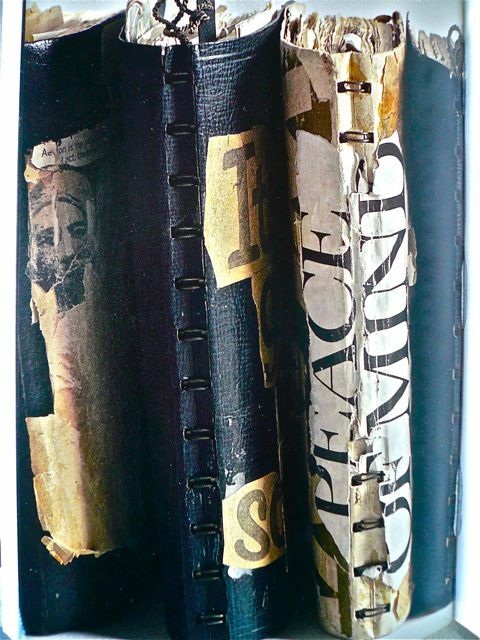 These are journals belonging to Diane’s mother Dorothy Keaton. She first started with a series of letters she wrote from her California home to her eldest daughter Diane, who had moved to NYC at age 19. Letter writing developed into full volumes of family journals and scrapbooks. Further, she had kept detailed documentation of Diane’s career from 1969 to 1984. With the onset of Alzheimer’s, Dorothy still kept close contact with her daughter through letters and phone calls, leaving phone messages which showed the signs of a mind quickly sliding down the slope. Now I’m alone, juggling with a memoir that’s also your memoir. Well, I’m in a hit, we opened the 29th… A real job, and on Broadway. Big stars have come to see it, like Warren Beatty (remember my crush on him from Splendore in the Grass) and Julie Christie, who is the most beautiful woman I’ve ever seen, and Liza Minnelli… Apparently Hair is the in thing to see. People stand in lines every day to get tickets. And on that note, Diane goes on to reveal her past battle with bulimia in the next chapter, a piece of private history that has been kept secret until now. As for Woody Allen, he didn’t even attend the Awards ceremony nor did he talk about it afterwards. Diane is also candid about her ‘romantic failures’, beginning with Woody Allen, then Warren Beatty whom she co-starred in Reds, and Al Pacino as they worked together on Godfather II & III. At age 50, Diane stepped out to make a most courageous move: she adopted a newborn baby girl, Dexter, and five years later a baby boy, Duke. Her role as a single mother bringing up a daughter and a son is probably the most gratifying. In between some serious skirmishes–like when he refuses to have his diaper changed, or when he starts crying because he’s been put down or Dexter has stolen his waffle, or when he bangs his head on the sidewalk… –in between these scuffles, there are moments that feel like an eternity of bliss. Through her memoir, moments Then are relived Again. It is also a catch and release, the challenging process of gathering and letting go. I love Diane Keaton. I was a film student for a while and we studied many of Woody’s films and that was my first introduction to Keaton. Even now though, she is and will always be, a class act to me. Have you seen The Family Stone? It came out a few years ago with Sarah Jessica Parker, Craig T. Nelson, Rachel McAdams and a whole bunch of other people. A very good movie to see this time of year. It’s all about family and Christmas. Excited to learn that you used to be a film student. I’m glad to know Woody Allen’s films were being studied in film school… and not surprised at all. I watched the PBS documentary on him last weekend and just confirmed my respect for his genius. It takes a talent to recognize a talent: glad that he discovered Diane Keaton, who I’d say, is a natural… just like the ‘costume’ she picked for Annie Hall. Oh, and of course it has Keaton in it! Yes, I’ve seen The Family Stone and remember that it’s a heartwarming movie, but details I’m afraid I’ve forgotten. I went back to the book to try to find if Diane has written anything about it, but seems not. oh my. what a gift from a mother to a daughter, and a daughter to the world. Thanks for the beautiful post. 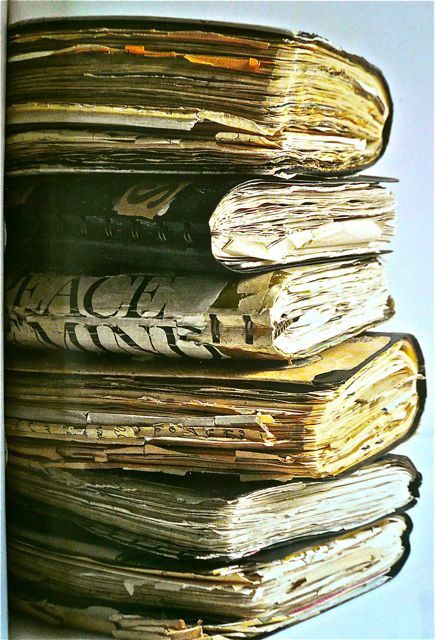 Those journals are art in themselves. Mind you, Dorothy had to struggle with depression and journaling was a release for her. There are definitely sad notes between the covers. This sounds like a lovely and brave book. And wow! 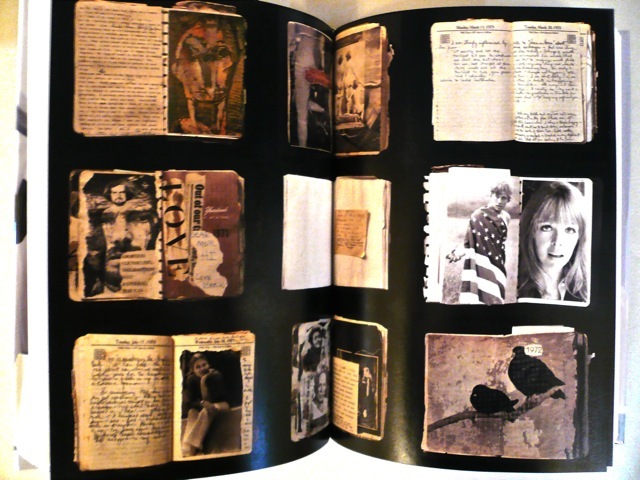 those journals and scrapbooks Keaton’s mom kept! What a treasure. You’re right to say she’s brave, exposing her own self and those in her family. It’s definitely a worthy read… and those photos are a pleasure to look at. I usually steer clear of celebrity memoirs, but your review has me considering this one. Will also echo Ti’s recommendation of The Family Stone… a wonderful movie! Diane Keaton probably would not see herself as a celeb. The way she writes this book is so transparent and authentic, filled with self-deprecating remarks. I got a Tweet from someone who heard her reading from this memoir, saying she had to hold back tears as she read. I admit at some points I was deeply moved by what she wrote. I’ve never been a huge fan of Diane Keaton’s acting, much preferring to watch her play Annie Hall than any other role (as you said). There’s something about her that annoys me, and yet I find her costume in Annie Hall (imagine, not a costume at all!) so endearing. Then we come to those journals, those attempts to reconnect with her mother’s memories, and I’m undone. Such beauty in those books; I want to open them, their thickness, their scent must be something!, and read them right away! As a journaler myself, they’re quite exciting. I wish mine had the same stuffing which expands the covers. This was an especially interesting post, Arti. I do hope I’ve changed your view on Diane Keaton. Here, she writes not as a movie star, but a daughter, a sister, an actor, and a mother. I can see why this is a book that needs to be written, it’s her tribute to her dear mother. 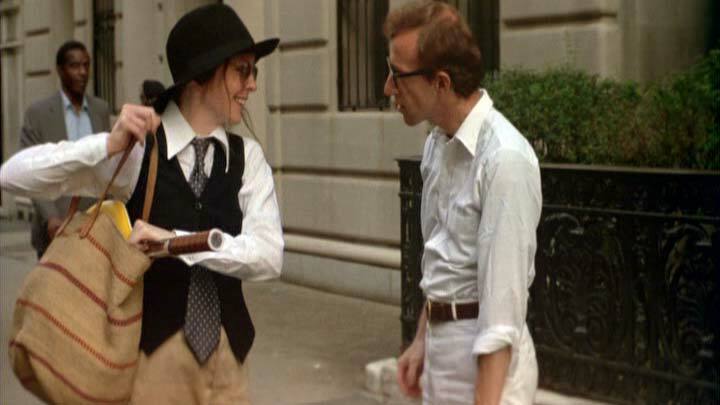 And you know what, the ‘costume’ in Annie Hall, yes, they were her choices, and it was all the ‘cool-looking women on the streets of New York’ that gave her the ideas… the khaki pants, the vest, the tie. And the hat? She got it from Aurore Clément. The person who intrigues me most here is Mary Hall. The quotation you reference doesn’t seem particularly nasty to me – but I haven’t much patience for Woody Allen, so perhaps it’s only a matter of feeling a vague prejudice confirmed. What I find most deeply touching is Diane’s pledge to “unleash Duke and Dexter from the stranglehold of my need before it’s too late”. That level of self-awareness is remarkable – so often we say we are protecting others, when in fact we are protecting ourselves. I must say – at age 65 myself, the thought of a 14 and 9 year old is daunting. Whatever her successes and failures in her work, taking on the challenge of motherhood at that age is remarkable. It’s not something a prototypical “celebrity” would do. For some reasons I knew you’d find Mary Hall an interesting character from the quote. Well, she’s not what you think she is. Allow me to clarify. This quote may well be the most favorable and positive statement from her, that is, according to what I’ve read in the memoir. I was going to just use the word ‘feisty’ instead of ‘nasty’, but no, that’s not Diane’s accounts of Mary Hall. But I’m not here to badmouth others’ Grammy, just to clarify. Mary Hall’s husband left her just three months into their marriage and never to be found. She remained bitter and abrasive her whole life (but who knows which is cause or effect?). She was emotionally detached towards her son Jack, locked him up in a room and walked away when he misbehaved. Diane suspected that this could be a reason for Jack’s distance from his children. She was negative and critical towards all including her grand children. Mary Hall accumulated wealth by being a ‘loan shark’. “She hates Jews” is Annie Hall’s description of her in the movie, which mirrors the real life person as well. So in a way, what she said in the interview is high praise indeed, especially for Woody Allen. Yes, it takes huge courage and commitment to adopt two babies in your 50’s, and raising them up as a single mother. Diane Keaton’s doing a marvelous job too. One may not be a fan of her acting, but just have to admire her for taking up such a challenging role in real life. I’ve had these in my files to pass on to you – the first is Joan Didion writing on Woody Allen, and the second is a response, with a comment from Didion.. I think you’ll enjoy both, whether you agree with Didion or not. Thanks for informing me about this piece of history regarding Didion’s animosity towards Woody Allen back in the 70’s. My opinion is that: the questions Ingmar Bergman asked in his films regarding love and betrayal, marriage and separation, life and death, reality and fantasy, psychosis and normalcy, are also asked in Woody Allen’s films, but in jest, most of the time. And when he chose to do a drama like Interiors, Didion took it as a comedy, a very ‘adolescent’ reaction. Ironically, being ‘self-absorbed’ and ‘privileged’ are exactly what some critics view her recent memoirs. Though I love Didion, I have to agree. Of course, what I would have said or written in the ’70s would have been quite different than what I write today, so I’m willing to cut a little slack on that account. I do love primary sources, though – especially in literary wars! I took note of the book’s release and thought then I’d like to read it. Keaton is one of my two favorite actresses — The Family Stone my favorite of all Christmas films. But having read your review — I know this memoir will be a very special read — for reasons that have little to do with my feelings about her thus far — and just thinking about the words that I’ll soon unwrap and then read — well, it fills me with joy. I think one would enjoy it even if one’s not a fan. So I’m sure you’ll find it moving if you’ve followed her career. You’ll be gratified to know the person behind the roles, and respect her more as a wonderful human being. I really like Woody Allen movies, so hurray! I have actually seen Diane Keaton in action. This sounds like a very intriguing memoir, and much more than a celebrity book put together for publicity. I’m on a longterm memoir kick and will look out for this one. Thank you for the review! Did you see her on the set filming? That would be a memorable experience. As for WA movies, he did make one in London a few years back, Match Point, have you seen it? I was on a Bergman binge a while ago, watching 9 films in a couple of weeks. Now I’m on a WA binge, rewatching a lot of his movies and respecting his talents more and more. And what I’ve found is, his films have a lot of Bergman influence. Interiors is a prime example. I saw Keaton on Daily Show talking about the book. I’ve always loved her — thought she got pegged into one character early on then broke out so gloriously. I’ve admired her acting, her versatility, her role as a photographer. So, when she was speaking about this book, I thought, “I’d like that one.” I can tell you, after reading this, it went to the very top of my Christmas list. It pulls together all the things I find fascinating — memoir, film, family, the theatre. Amazing. Did you see the American Masters documentary on Woody Allen? It was about three fascinating hours. I found his remarks on Keaton and hers on him (in the doc and on Daily) just wonderful and wished every couple I ever knew who had parted could be so gracious and sincere. I was reading Diane’s memoir at the time when that documentary came on PBS, saw it both nights. Now I tell you, that book is a great compendium to the doc, or vice versa. Diane is very candid and as you observed, very gracious towards and respectful of Woody. And when she adopted Dexter, WA sent her baby girl a little dress. Sweet, isn’t it? It’s interesting too to know from her book that WA didn’t care for any awards, didn’t go to the Oscars ceremony, didn’t talk about it afterwards. As for Diane, it’s a family affair. She sat with her sister Dorrie, her parent also attended. As for the doc, it’ll make a nice Christmas gift too. Wonderful review! I’m a big fan of Keaton’s – and so happy to hear that this book is well-written. Definitely going on the to-read list. Welcome! Yes, it’s a moving memoir. Thanks for stopping by and leaving your comment. For whatever reason, this morning, as I read your account of Keaton’s book, I am in tears, that is to say, a bit teary. Yes, I’d love to get the book, too. Yes, the photos you begin with are reason enough! I’ve been wondering if this book would be good; I’ve long been a fan of Keaton though not always sure why. Perhaps it was Annie Hall. I dunno. But thank you for this. As corny as it sounds, I’ll put this on my Xmas list and hope someone’s paying attention. On a completely other note, yeah, I’ve been supremely absent on Twitter and will get back to it AND I have to go back through your blogs to see if you’ve written about THE DESCENDANTS. We just saw the movie last week and I am certain, following some excellent post-film conversations with HM, that I would love talking about it with you as well. Geez, there’s some excellent work in that film. And on the lighter side, I loved the soundtrack. I’m sure you’ll enjoy this memoir, and be moved much more. As for The Descendants, yes, I’ve just seen it. I’ve enjoyed the excellent acting by the main characters. George Clooney has put on a poignant performance. The kids are ok too, and the splashes of humor make a good balance. The Oscar buzz it’s gathering is justified I think. I haven’t written about it yet… not sure if or when. But since you’re a fan, maybe you’d like to read the book on which it’s based, the novel of the same name by Kaui Hart Hemmings. You may like to check out her website here. I really love her, and I find this review and the book wonderful and appealing. I am happy to see that she is as smart as I always felt she was inside that dumb persona. I love how she is honest, and those bound letters, can anything be more beautiful? No wonder you were smitten; I am too. I did not know she adopted children, and I think of her movie “Baby Boom” and how that must be somewhat autobiographical. I look to her as a model for a woman who embraces the best of growing older with experience and confidence. And how incredibly cool that Woody Allen told her to wear what she wanted, and she established an iconic look that will never go out of style. Thank you, Arti! I love love love this post. When she made ‘Baby Boom’ she was 40. But just who can imagine a woman in her 50’s would start adopting babies. I’m amazed how well she’s doing as a single mother. The accounts in the books are very moving. There are photos of her small family… they’re adorable. And I totally agree with your perception of her… “she is as smart as I always felt she was inside that dumb persona.” Her honest and self-depracating remarks only reveal insights and wisdom. Thanks, Arti. She did an interview with Charlie Rose a few weeks ago, promo for the book. It was fascinating to listen to her. You should be able to get the interview on Charlie Rose website. Great! I’ll definitely check that out. Thanks for letting me know. What I dig about Diane Keaton is that she truly seems to march to the beat of her own drummer, fashion-wise. Love those Chico’s commercials she’s currently in. I love D. Keaton as she is just so natural –growing old gracefully. I would love to read this book. “growing old gracefully.” Totally agree with you!